By Solidarity Halifax member John Hutton. Originally published in The Chronicle Herald. John is an undergraduate student at Dalhousie, pursuing a degree in international development studies and economics. 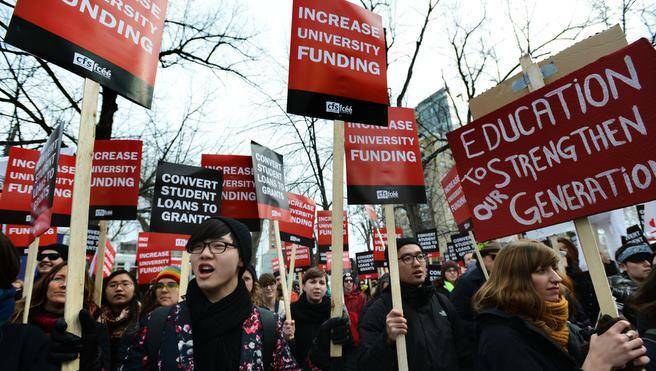 After four years of tuition fee increases, funding cuts and even talk of university mergers, students had good reason to be optimistic when a new provincial government was elected in October 2013. In saying so, he was correct. Post-secondary education is beneficial for the economy, returning an estimated $8 to Nova Scotia for every $1 invested, and is an important source of good jobs in Wolfville, Sydney, Antigonish and Halifax. Education results in higher earnings and lower unemployment (yes, even BAs). That means a bigger tax base for important social programs. Education is more than just a good investment, of course. It has a transformational effect on people that improves quality of life and society as a whole. According to the Association of Universities and Colleges of Canada, education measurably boosts social benefits such as dynamic impacts through innovation and knowledge creation, knowledge spillovers that increase skills and productivity of less-educated workers, reduced crime, increased civic participation, improved health, intergenerational benefits passed on to children, increased volunteerism and charitable donations and more. Education helps us make sense of society, imagine a better world, have free and open discussions about how to make these ideas a reality, and then do it. So Mr. McNeil was really on to something when he said that education shouldn’t be seen as one more expense to trim when trying to balance a budget. Unfortunately, but perhaps unsurprisingly, that was just rhetoric to win votes. Since coming to power, the Liberals have eliminated interest on the provincial portion of student loans, saving students roughly $800 —roughly equal to the cost of one year’s worth of tuition fee increases. Then they eliminated the $50-million Graduate Retention Tax Rebate. That money was not re-invested in more effective debt relief for students. Meanwhile, Ms. Whalen’s been musing about removing the top income tax bracket and lowering corporate taxes, which would cost $72 million to implement. Perhaps she thinks they’re entitled to that money. This year, the government will sign a memorandum of understanding (MOU) with the Nova Scotia university presidents — something that’s done every three or four years to regulate fees and allow for multi-year planning. For the first time, students were excluded from these negotiations, which is not a good sign. As they say, if you’re not sitting at the table, you’re on the menu. Labour and Advanced Education minister Kelly Regan, who once said, “Why is it OK to be on the side of students when you are in Opposition and then ignore them when you go into government?” now has more to say about cutting $50 million than about making education more accessible. There is good news, thankfully. The first piece is that there are plenty of good alternatives. That $72 million that Mr. McNeil thinks we can get rid of? That could convert 100 per cent of Nova Scotia student loans into grants and reduce tuition fees by 24 per cent instead. So we can afford to reduce tuition fees. Given that students in Nova Scotia pay the third-highest fees in the country, graduate with $37,000 in debt on average, and graduate into an economy with an 18 per cent youth unemployment rate, reducing tuition fees is a really good idea, too. The other piece of good news is that students have the power to change things. We saw what happened in Quebec when the Liberals there tried to raise tuition fees by 75 per cent — students brought down the government and unseated the premier. But even here in Nova Scotia, student action has won victories for students: a 2007 provincial day of action won a four-year tuition freeze; a 2011 day of action stopped plans to deregulate tuition fees; student actions in 2011 rolled back a proposed increase in international differential fees from 10 per cent to six per cent; student petitions at Dalhousie in 2012-13 reversed cuts to library hours and academic journals. Despite the ideological support of the McNeil government for tax breaks for the rich and cuts for everybody else, students should be optimistic and energized. What the politicians offer isn’t the way things need to be. Through collective and persistent actions, students have the power to change things, too. We know that education matters. We know that education is worth fighting for, and we know that affordable, accessible education is possible. So students, let’s remind Mr. McNeil that education isn’t a line item in a budget. Education is a right.